Last edited by dreadnut; 02-08-2019 at 07:33 PM. Thought it was gonna be a new band. Whatever it is - over here we can't see it . . . But in the pic you put as teaser I can see that cold weather is performing it's tricks. 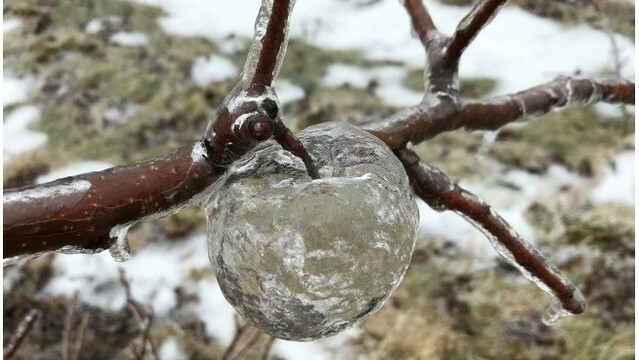 Rotted apples left on tree became encased in ice, turned to mush, and then leaked out the bottom before the ice melted. That might be so - or not - have to check my garden one of these days. Encased in ice - yes. Mush having lower liquid temp than ice? No no & NO ! Whatever - the pic is nice. "the temperature provided the perfect recipe: it was cold enough for the ice to remain, but warm enough for the apples to turn to complete mush, since apples have a lower freezing point than water." And yes that's possible, it's the principle behind those first aid ice-packs: It's water and starch. When they DO freeze they they're colder than plain ice and take longer to become liquid. Same principle explains seawater not freezing until about 28 degrees F but in that case it's the salt..